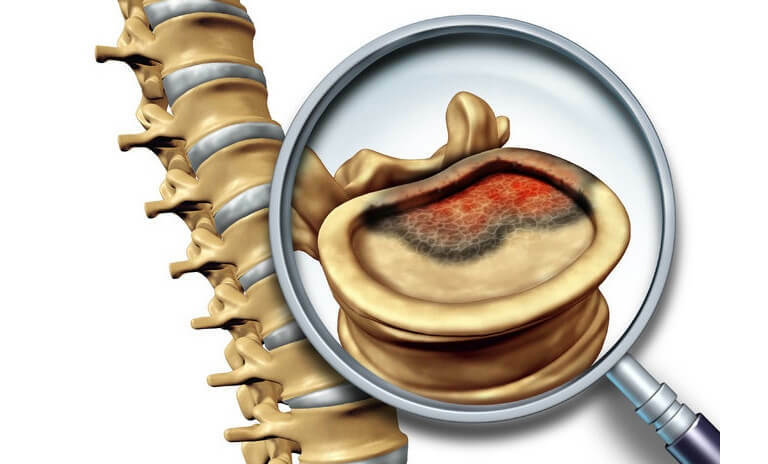 Cancers of the spine refer to a mass of aggressively growing abnormal cells in the spinal canal or the vertebral bones that make up the spine. Around 90% of spinal cancers metastasize or spread to the spine from lung or breast cancers in females and prostate cancers in males. Spinal cancers can be divided into primary or secondary types with primary referring to cancers that have developed within the spinal column or spinal cord. Secondary spinal cancers refer to cancers that have metastasized from different parts of the body to the spine. Wherever the origin may be, these types of cancers can cause severe disability and even death. The risk factors for primary spinal cancers could include genetic elements as well as a compromised immune system. Exposure to certain industrial chemicals or radiations could also increase the likelihood of spinal cancer. The symptoms of spinal cancers depend on factors including the size and stage of the cancerous growth as well as its exact location. Usually primary spinal cancers develop slowly with the symptoms developing accordingly. While there is no ‘one size fits all’ as far as cancers go, secondary cancers that have metastasized to the spine from another part of the body usually grow in an accelerated manner. The most common symptom of spinal cancer however is pain; this occurs due to the pressure exerted by the cancerous mass on sensitive nerve endings. Other common symptoms include numbness, tingling, weakness and difficulty in urination and bowel movement. Other signs and symptoms may also develop as the disease progresses, and varies with each patient. Diagnosis of spinal cancer is based on history taking as well as on imaging results. These include x-rays, CT scans and MRI scans. Treatment modules depend upon the age and health of the patient, and the stage, size and location of the cancerous growth. CyberKnife radiosurgery is a comparatively new type of non-invasive surgery used to destroy such growths.